The long-awaited companion to the Interstate Commission on the Potomac River Basin’s popular “Potomac River and C&O Canal” map set is now available, covering the upper half of the area from Shepherdstown, W.Va., to just upstream of Cumberland, Md. A valuable resource for canoeists, hikers and outdoors enthusiasts, this colorful five-map set is printed on waterproof, tear-proof paper. The maps include information on boating, public access sites, support facilities, camping and fishing sites, and picnic and parking areas. The maps are filled with cultural and historical information, safety tips, and contact information. This handsome guide to the river and canal was produced by ICPRB, the Maryland Department of Natural Resources, National Park Service, and the West Virginia Department of Natural Resources. Pay online via Paypal or use our convenient Map Order Form. 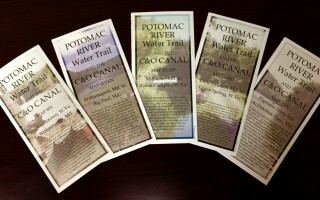 Maps are also available at the ICPRB office in Rockville, Md. during normal business hours. The Lower Potomac Map Sets (from Washington, D.C. to Opequon Creek, Md.) are currently unavailable, however, they can be downloaded and printed from our website.